Winston Smith is the editor of Return Of Kings. Why would anyone learn a language? Usually we wish to improve ourselves, develop an understanding of a foreign culture and, often most of all, communicate with beautiful women who would otherwise be inaccessible to us. If you’re planning to take a trip or live abroad, as part of your preparation you should find a way to combine language study with learning about the girls in your new locale. Enter iTalki, a website that connects you to like-minded language students across the world. You can pay reasonable rates for private studies over Skype, write journal entries, and send messages to other students. 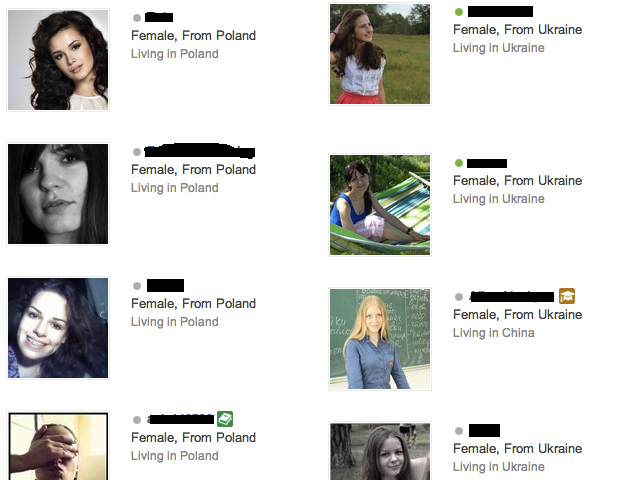 However, iTalki really shines because of its search tool, which includes pictures of your potential language partners (girls, in this case), whether they are a native speaker, their skill level in your language, and a filter for city and country. Pipelining is an increasingly important aspect of international travel. Whereas before most traveling players would dropping into a remote area and begin building contacts, the westernization of foreign countries ensures girls have exponentially more male contacts hitting them up on their iPhones. A numbers game is necessary for building both a prospect base and a social circle prior to your arrival. Unlike OKCupid, where you are immediately put in a position of begging for dates as a confused foreigner, iTalki is a value exchange — you meet cute girls and help them with their English, while they help you with your French, Spanish, Russian, whatever. Even if you’re a clod, you’re likely a native English speaker and an American. Though that alone rarely gets you respect in the clubs in Helsinki or Buenos Aires, it projects value in this situation because many people wish to learn English and practice speaking with Americans. This type of sniper-game rewards the erudite player who is looking to improve himself in the process of finding new prospects, and helps meet women who are trying to do the same. If you go to the bar, drop time and cash on a night out, and go home discouraged after getting blown out in your few approaches, what have you really accomplished? These growing pains are necessary evils for building the toolbox of your game, but improving your skills doesn’t always require an outlay of time and monetary for zero guaranteed value. Talking to cute girls on this website allows you to devote your time to two things at once, both of which synergize to make the other better. Even if your game is a rebuffed, you have still better equipped yourself for a trip or living abroad. Not bad. iTalki helps you get better at actual communication, talk to cute girls, and get the local flavor before you drop into a completely new environment. What could be better motivation to keep at your language studies? Awesome article and great info. Pipelining for a trip abroad AND sharpening your language skills simultaneously, already armed with a perfect approach and ice breaker. Win win. best way to learn another language – get in bed with a native speaker that doesn’t understand english…. you seem to learn it in your sleep…. Great article. I enjoy the self-improvement content more than the anti-blue pill content, though both are fun to read. I took the red pill about 3 years ago, perhaps I can only agree so much? The aspects of this site that contribute to positive male development are its most valuable, be it fitness, style, game, etc. I’ve never used iTalki, but I used a similar tactic back during the “Skype Me” Mode days in Japan. There are a lot of free alternatives to iTalki, though you might have to weed through more people to find what you want. Are there any you would recommend? I have never paid a cent for iTalki — fees only apply if you want personalized instruction. Finding practice partners is completely free. Would you say this site is only good for working on knowledge you already have, or can you actually learn a language from the ground up from language partners? I speak fluent English and okay German. Would like to learn russian but barely know a lick besides yes, no, hello, and goodbye. I would advise you to start with a beginner course (Rosetta Stone, first unit of Pimsleur, etc.) so you can at least have a base of sentences/phrases/grammar to draw upon. You won’t be able to have even remotely meaningful conversations if you don’t at least know a few verbs, vocabulary words, etc. Of course, the girl may prefer to just speak English both ways, but to really get something out of the language learning aspect i wouldn’t go in completely cold. Rosetta Stone is vastly overpriced, and its reputation is mostly down to slick marketing. There are language exchange forums, instant messengers, and so on. Depends on the language that you want to learn. Do you guys know where I can find Battletoads? this is a self-improvement site tho so..
Who the hell is this troll “John Doe” who keeps spamming this site with that image and comments about Battletrolls? He needs to be banned from RoK otherwise it deserves to be called what the mainstream journalists call it – “Return of Jokers”. Right that’s it, I’m off to France. Good article. Will definitely download this iTalki. I’ve been using http://www.duolingo.com/ which is similar to rosetta stone but free. It also works with the repetition technique, although doesn’t offer the conversational perks of actually speaking to someone else. I’m real glad you posted on italki. I’ve checked out numerous language exchange sites and italki seems to be the most organized and efficient to me. The class rates are unbelievably cheap as well. Private Spanish lessons are as little as $6 / hr from some teachers. I try to tell everyone about this site who’s learning a language. Some people spend 100’s of dollars on Rosetta Stone and ineffective language schools when they could invest their time and money in cheap classes online and see 10x better results, in my opinion. Good stuff. Languages give you the chance to do so many amazing things. Therefore it must be said – don’t exploit anyone who wants to learn English from you. As a teacher of the English language, whether online or not, it’s your duty to treat your students and peers with respect and dignity. Be a good representative of your country. Don’t try to hit on anyone over the internet who is there only for the purpose of education.